Having a touchscreen on your mobile computer can be very useful. It makes surfing around way easier, web-browsing more fun and intuitive, can help you take hand written notes, etc. Of course, all these if the touch display used on the machine is accurate and reliable. Such laptops with touch-screens that can be easily swiveled, transforming them into veritable tablet PCs, have been around for a while. However, most of them aren’t at all affordable, having price tags of 1000 bucks and more. In the last years though, a new class of such gadgets emerged: the tablet netbooks, computers able to combine the qualities of a mini laptop (portable, light, cheap) with those of a touch-sensitive display. Below you’ll find the most appreciated such computer available on the market, based on my experience with them but also feedback from expert reviewers and regular buyers. Once again, this is not a top of best tablet netbooks, but a list. All the mini laptops in here are very good and you should be able to choose between them the one better for you, based on your requirements and budget. Update: While tablet netbooks were quite popular a couple of years ago, they were quickly replaced by standard tablets, like the iPad and the Android slates. So you’ll hardly find netbook tablets in stores these days, but I’m pretty sure that might change once Windows 8 gets here and we’ll see cheap laptops with convertible touchscreens once again. If you need a convertible netbook with a compact and light body, this Asus is the one for you. With an 8.9 inch resistive display (with multi-touch) and weighing just around 2.1 pounds, the T91MT can become you best travel partner. Inside you’ll get an Intel Z520 1.33 GHz processor + GMA 500 graphics, 1 GB of memory, up to 32 GB SSD storage, a 6 Cell battery capable of up to 5-6 hours of life in real-life tests and Windows 7 Starter as the OS. Outside, the device looks good, but comes with a glossy exterior and only a standard flat keyboard (decent, but not as comfortable as a chiclet one). Overall, the device is more than interesting. The version with the specs mentioned above sells right now for around $433 (with Free Shipping included) and benefits from some very good reviews from previous buyers. However, while it is a very nice and affordable light tablet netbook, it does have its drawbacks, the biggest one being the small storage space (also difficult to upgrade) and the lack of palm-rejection technology (screen won’t detect your palm when taking notes, so you won’t be able to lean your hand on the screen like on a regular piece of paper). 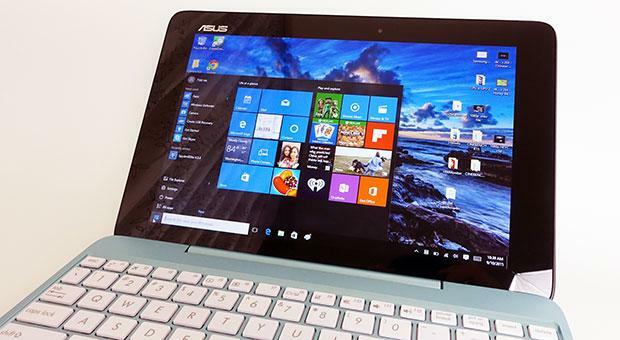 The much awaited Asus T101MT was expected to solve much of the inconveniences the T91MT had. And it mostly does. For starters, the T101MT is a 10 inch touch screen netbook, so it’s a little bit heavier and bigger than the 8.9 incher above. Comes with a multi-touch resistive display, one that’s actually quite precise once you calibrate it. Can be used for all kind of activities and hand-writing works just fine in Onenote or other similar programs (you do get palm-rejection on this one). 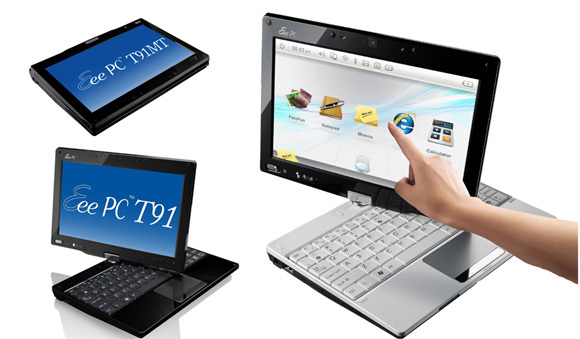 The T101MT is still fresh on the market and at the moment there’s only one version available in the US, with the N450 processor + GMA 3150 graphics, 1 GB of memory, 160 GB storage, 6 Cell 5 hours battery and Windows 7 Starter. On the outside is where the T101MT really impresses, being right now perhaps the best looking 10 inch netbook (in its price range, of course). It’s only available in black (a white version should be available soon too), but the matte finish is amazing and overall build quality is very solid. Also, you get a very nice trackpad and ergonomic chiclet keyboard, so using the device in the classic laptop mode will be a delight. As for prices, the Asus T101MT is available right now in the US for $458, with Free Shipping included. You can buy it, see more pics, detailed specs or read reviews from buyers by accessing this link here. And there’s one more thing: performance levels are decent for this Asus (as decent as they can be on an ATOM N450 powered device), but i do advice upgrading to 2 GB of memory and Windows 7 Home (so you’ll be able to benefit from multitouch). And if you want to know more about this device, i do recommend reading my full review of the Asus EEE PC T101MT, with pics, videos and thorough explanations. Also, check out this post for a comparison between the T101MT and the T91MT. The Lenovo IdeaPad S10-3t is a device pretty much identical in terms of specs to the 10 inch Asus above. Inside you get the same hardware, but the 10 inch display is capacitive. This means it’s going to be more responsive when used with your fingers, but will make hand-writing more difficult (you’ll only be able to use a special pen – provided in the pack – and the results are not as good as on the Asus T101MT). Also, the Lenovo is not even in the same league as the Asus when it comes to looks. First, it’s bulkier, heavier and glossy. Then, it only offers a standard flat-keyboard and the trackpad is one of the tiniest I’ve ever seen on a netbook. However, it comes with a better battery than the Asus (an 8 Cell capable of up to 7 hours of life in real tests – but this adds up to overall weight) and accessing RAM and HDD for upgrading them is a lot easier. The Lenovo S10-3t sells for $498 in the US, with Free Shipping included. You can access this link for more details about it, more pictures and reviews from users, plus the options to buy one yourself. It’s up to your judgment if the small advantages it has over the other tablets in this list compensate for the lacks and the slightly bigger price. I for one like the bigger autonomy, but still I would rather go for the Asus. 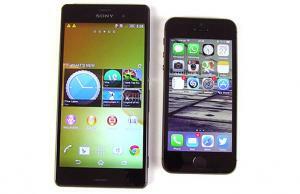 When you’ll first lay your eyes on a Viliv S10 you’ll be amazed by how slim it is. This one is also a 10 incher and you can see it compared to the Lenovo and Asus above in this clip. But although slim, it’s not that light, weighing around 2.8 pounds, so definitely not a competitor in terms of weight for the smaller T91MT. I’ve mentioned this tablet as the Viliv S10 shares similar hardware platform: Intel’s Moorestown. There are going to be many different versions for this tablet netbook, the entry model offering an 1.6 GHz Z530 processor, 1 GB of memory, 32 GB SSD storage and Windows XP Home, while the top one will come with a 2.0 GHz Z550 CPU, 2GB of memory, 64 GB SSD, buil-in HSDPA and Windows 7 Home. The Viliv S10 has a couple of strong points over the other mini laptops listed above, like the HD 1366 x 768 px display (multitouch resistive), the faster CPUs, the SSD storage and the bigger battery life (up to 10 hours). You can read more about these in this preview of the Vilis S10 series. All the mini tablet PCs listed above were built on various versions of Intel’s Atom platform, one known for energy efficiency rather than power. So while offering decent performance levels, when faced with heavier tasks, these tablets might choke. And here’s when HP’s TouchSmart TM2 comes in, a device a little bit bigger than the others above, with a 12 inch screen (also recommended in my list of best 12 inch mini laptops). So, overall heavier (4.7 pounds) and less portable than the tablet netbooks above, but if you can put aside these aspects, the HP TM2 is just the perfect mini notebook: powerful, good looking, solid, with good autonomy and affordable. Let’s take them one at a time. First, inside this device you’ll get the Intel dual-core Core i3-380M processor + Intel HD graphics, 4 GB of memory, 500 GB HDD (7200 rpm) and Windows 7 Home Premium. Combine the power of that hardware with a 12 inch capacitive multi-touch display and you’ll end up with quite an experience. In terms of looks and build quality, the pictures below speak for themselves: there’s little to nothing to reproach this TM2. Also, notice the full-size chiclet keyboard and big trackpad. The TouchSmart TM2 packs a 6 Cell battery able to offer up to 7 hours of life on paper, so probably around 5-6 in practice, more than you’ll need. All in all, the TM2 is a great tablet laptop. It’s not as compact or light as the above netbooks, but definitely more powerful. As for the price, the HP TM2 with the above features sells right now for around $850, with Free Shipping included. That’s nearly 80% more expensive that the Asus or Lenovo options presented above, but if you’re a performance addict like me and want a snappy touch-experience, the difference is well worth it. That’s about it for now. I’ve showed you a couple of different options for best tablet netbooks. Based on you budget and preferences, you should be able to choose one that will fully satisfy you. Of course, in the near future more and more such compact and affordable touch screen netbooks will enter the market, that’s why you should check out this post from time to time for updates. Also, if you have any questions or need any advices regarding small touch tablets, don’t hesitate to post your comment and I’ll be glad to help if I can. 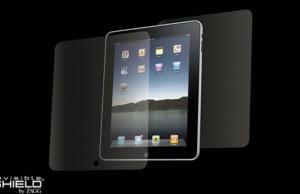 Zagg InvisibleShield for iPad – best iPad screen protector? I appreciate the info, but I can’t find a date on any of these articles. I think when your writing articles about technology date is indispensable for readers, since things become outdated so fast. I see your point Ray. I’m working on adding date too. Hi ,I need to walk and map with a light unit to run Correll paint or similar.what would you suggest? When you pair Windows 7 with a touch screen PC and Corel Paint it! touch, you can draw, paint, sketch and create photo paintings using nothing but your fingers. Make sure your computer is fingertip-ready! Are any new tablet netbooks expected to be put on the market in the next month or two? Is the Asus available only with a 160 GB hard drive, or is there an option available for more hard drive? What about the HP 5103, which has the option of a touch screen? Is it just a touch screen without turning into a tablet? What is the advantage of the tablet? I see that you didn’t mention the Lenovo X201. Was there a specific reason for that? I’m looking for a mini tablet with 9′-10′ screens, very powerful and lightweight (preferably not above 3lbs). It would have to have 3G. It should replace and better my late Fujitsu P1610 by a significant margin. My budget extends to USD 2000. Is there anything out there that would fit? Hey, it didn’t because it is very very expensive. If you can afford it though, it is the best you can get these days. The X201t tablet is the one I’m talking about. thanks for answering. I’m trying to buy a Fujitsu P1630 on ebay today. It’s not nearly as powerful as the Lenovo, but it will do. I has all the other specs, except for 3G. Yep, I’m quite aware of it. OTOH the form factor is important, so I’m trying to get the fastest and most powerful tablet in a 10-inch packet. Apart from the Flybook V5, which is rare and VERY exotic (which essentially means I won’t get service) the P1630 seems like the way to go. I’m looking to get a light tablet for my mother. I’m just worried that something like the Asus T91MT won’t be able to handle videos. Would it be able to render DVD video from an external optical drive? Hi Mike. I need a netbook tablet as a sketchbook device. Which of all those that you mentioned would be capable of having a pressure sensitive stylus. If possible, it would need to handle programs like Sketchbook Pro, Gimp, and ArtRage. Main reason for a netbook tablet is because of the cost. And I still would use my desktop for finished artwork while using the digital sketchbook for archiving my sketches for day to day use. It occurred to me, while enjoying the benefits of all your hard work and research, that all of these are considered very good. 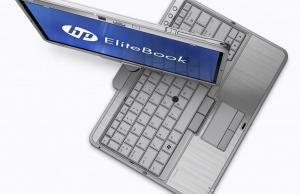 How would you feel about (if you haven’t already and I just missed it,so far) making a list of netbooks that would be considered simply bad **by most everyone’s standards**? Have you seen the Ausu 1825 PTZ? I got one from Hong Kong and like it. It is powerful enough to convert video while playing in HD 1080, and in netbook mode it is very responsive. Can you use the touch screen with Microsoft Office programs…mainly excel and word? The new Asus Eee 121 is also a nice option. 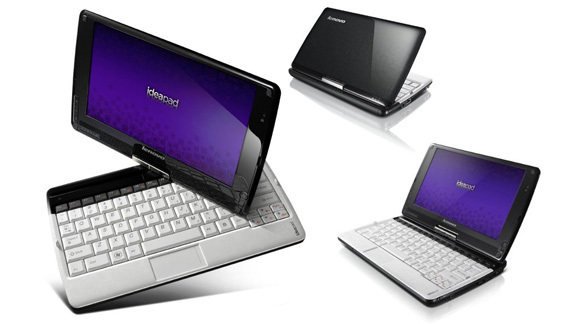 I really like the idea of having a convertible netbook that works both as a laptop and a tablet pc device. What aboout the Fujitsu t580 Got one recently and it is great. Powerful…runs Photoshop and Power director no problem. Touch screen very comforable and a gentle introduction to tablet computing. Screen size very mobile and yet still OK from a visibility perspective. Very quickly becomong a cannot do without? Hi, I’m looking for a laptop same specification as the tm2 but with an optical drive(around 1000 bucks) . any suggestions ?? I like the sound of the HP in this article, but I have some reservations about their products after owning one of the infamous over heating laptops a couple years ago, and so have opted to stay clear of them since. So can I safely assume that the products HP product these days are of much better build quality with a bit more thought put into their design? Other than price, how does the gigabyte T series compare? They are very nice, but expensive. I though about adding them here, perhaps i will soon. They are also kind of bulky for my taste. Fujitsu as well have some tablet laptops in this class, but those are even more expensive. Regarding the November 10 2010 post from Joel for a device where you can draw, paint, etc. ; do you have any product recommendations? I’m looking for a powerful, light, w7 convertible tablet preferably under 12.1. Touch should have palm rejection. Price is not the biggest concern, but battery-life should be good. SSD would be great. I want to know if any of these is available in India, be it via online purchase or any stores you can tell. I am interested in buying one netbook with touch screen. please give me some options that are available in India. also, It has to be VERY light weight. I was thinking about to get a Tablets but i have no knowledge of computers and there are too many of so many different names that i can possibly know. p.s. she already have a Macbook pro but She needs a PC.